Open plan lounge dining living area downstairs with 2 bedrooms each with 2 single beds.Main bathroom with separate shower. Kitchen has integrated fridge, freezer,washing machine, dishwasher,tumble dyer,steam iron & board. Living area contains flat screen TV, comfortable seating & plenty of books/games. Very large master bedroom has vaulted ceiling. The kingsize bed has a memory foam mattress with luxurious topper. All bedding used is high count cotton. Parking for 2 cars alongside. Welcome to tranquility:I would love to welcome you to my Swedish designed holiday home; guests usually comment on its tranquility & many have described it as a retreat.They enjoy sitting on the balcony watching the sun go down, enjoying a glass of our complimentary Cava.On clear nights the stars will appear as there is little light pollution. As a guest you are welcome to use the very friendly Golf club bar or the restaurant which specialises in locally sourced , seasonal, organic meals. Sunday lunch especially recommended. In the evening there is nothing better than walking the golf course or in the woodland. A round of golf for guests is £20 & you can also have a 10% discount on lessons from Oliver, the golf professional. Our guests have been kind enough to compliment us on our holiday home ( see their comments ).The place is professionally cleaned after every letting. 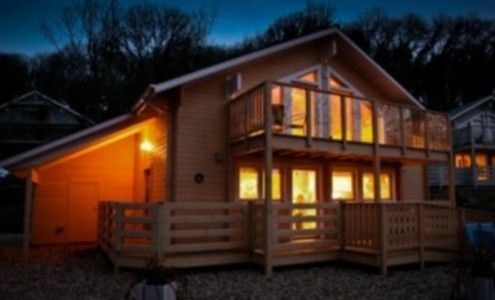 A perfect holiday home for you to enjoy: This is a very unusual high quality holiday home in stunning surroundings. I searched all over Wales before finding what to me is the perfect second home. I are so glad I bought it & so it seems are all our satisfied guests. Why not join the experience. Exploring the area: I have known Tenby all my life but since having my holiday home we are always surprised by new places I never knew about. After 1 1/2 years we are still exploring. Tenby has stunning safe, sandy, blue flag beaches, plenty of pubs, restaurants, shops & charm. For excellent coffee with a fantastic view try Cafe Vista or go upmarket for that special occasion at Plantagenate Restaurant. Nearby Skrinkle Haven offers walks on the Pembrokeshire Coastal path which reward with breathtaking clifftop scenery. The next beach along is Manorbier where you can see surfers & stone age burial stones on the headland. Skomer island has an abundance of birds. If you want to conquer a castle then try Manorbier, Pembroke,Haverfordwest or many others. Solva is a quaint fishing village on the way to St Davids Cathedral which is a day out on its own. There is so much to see & do in Pembrokeshire. We live about 50 miles away at the western end of the M4. Lynn is a retires teacher with a love of art and interior design. I am a retired tax inspector and I just enjoy the open road on my motorcycle. We were both raised in Carmarthenshire, but have lived and worked in Plymouth, London and Northhants before returning to live in our home county. Both our children have flown the nest. Our dream was to retire to Provence, but when the time came practicalities dictated otherwise. We looked at countless properties on the internet before coming to see Cysgod y Coed. It had yet to be fitted out but as soon as Lynn walked through the door she knew this was the one for us. Lynn has put her interior design skills to work and we have furnished it as a luxury home for ourselves and our guests to enjoy. On our first visit we were very impressed with the long drive from the entrance to the Manor House and then we saw our place nestling amongst the trees. Only a mile and a half from Tenby but a hidden gem in the grounds of a parkland golf course. It is such a friendly, quiet place to relax and enjoy. Main bathroom has bath, separate thermostatic shower with excellent water pressure, wc & sink , with thermostatic towel radiator. Vanity mirror with lighting.Tiled floor with underfloor heating. Sumptuous white cotton towels provided. ( not for beach use please ) En suite shower room has all the above but no bath. Feature round basin. Underfloor heating throughout, so just take off your shoes and enjoy it. Our linen is from such as Designers Guild and Laura Ashley etc. Tumble dryer in boiler room. Good access thanks to BT broadband. Please do not download films though as plenty on BT Vision system. One lounge area downstairs with tv. Main lounge upstairs. Very well equipped with at least twice what you need. Fully equipped with everything you could need to cook superb food. Including a good assortment of cookery books to inspire. There is an excellent restaurant in Manor House 100 yds away. Open plan, Caligaris table and chairs. Selection of cd and dvds. Gravel around property. Ramp to door. Unfortunately it is not possible to have wheelchair upstairs. The property is very well equipped with just about everything needed ( except beach towels ). BT Vision lets you watch films, record, replay, watch most programmes from the last week etc. We also have Wifi so bring your laptop. Very peaceful Lodge, fully kitted out and plenty of space. A stone’s throw from Tenby so very convenient location. Immediate responses from owners on any queries and all queries dealt with expeditiously. The cottage has everything you require for a weekend stay with family. Our girls had so much fun and everyone wants to return in the summer. Thank you Danielle. So pleased you all enjoyed yourselves. This property really is lovely. As 2 couples with 2 babies we found this christmas/new year stay to be ideal. Being on the grounds of Trefloyne Manor meant we used the golf course and spa whilst we were there. The property had everything we needed for our 4 night stay and would love to return in the future. From our initial enquiry to the return of the security deposit Trafford the owner was communicative and eager to ensure our stay was trouble free. The chalet was a delight. Ample room for 6 adults, and fully equipped to make it a home from home experience. We stayed over the Christmas period and had no problem catering for a full Christmas dinner. The property was spotlessly clean throughout with products in the cupboards to help you keep it that way. We enjoyed plenty of nice walks from the property to walk off all the over eating and drinking!! The Restaurant/bar at the Manor was just 100 mtrs walk and provided a good selection of quality food at reasonable prices. In all this break ticked all boxes, no hesitation to recommend. Hopefully we will be back ourselves sometime soon. Thank you Trafford and Lynn, keep up the good work! Unfortunately a log fire in the lodge is not possible. Glad you found everything else to your liking and I look forward to having you stay again. Lovely home with everything you need in a tranquil setting in a great location. It was nice to come back to each day and I enjoyed many a morning and evening sat on the balcony. Having two bedrooms with 4 single beds It was ideal for our family of 4 teenage boys and the master bedroom with ensuite was great for me and my wife. The living room was large, warm and naturally lit with the roof window and many windows to the front of the property and was very inviting in the evening with all the various lighting options. Having the washer and separate dryer was incredibly useful for us as we had limited space in the car to bring lots of clothes. Overall we enjoyed our time in the house and recommend it to others. Lovely weekend away with the girls! The cabin is beautifully decorated, well equipped and very clean. Large lounge area upstairs and balcony with enough space for everyone. A home away from home. Set in the beautiful grounds of Trefloyne Manor & Golf Club. It is very secluded & nestles in ancient woodland. Conveniently only 1.5 miles away from the centre of the fortified town of Tenby. Known as the jewel in the crown of Pembrokeshire. In Tenby you will discover a wealth of good restaurants such as Plantagenate, bars like the famous Coach & Horses, coffee bars such as Cafe Vista with views o the bay,safe sandy blue flag beaches & venture to Caldey Island with its historic monastery. Pembrokeshire National Park is all around with its magical coastal path ( ideal for walkers & birdwatchers ). Many other attractions include castles, St David's Cathedral, theme parks such as Oakwood & Bluestone, hills & ancient monuments. Skomer Island is a bird sanctuary. Fish for mackerel & bass from a boat. One of the Pembrokeshire coastal paths runs behind our property. Golf: Your stay will be in a woodland area about 100 yards from 1st tee. Very well kept grounds in spectacular setting. For further information just Google Trefloyne Golf. Naturally buggies can be hired. Tenby has a links course which is about a mile away & there are several good courses in the area. After your round relax with a drink on the front terrace looking out to Cysgod y Coed or the rear terrace overlooking the course. Alternatively stay in the very friendly bar & have a meal prepared by the chef from locally sourced organic ingredients. If your partners do not play there is plenty to do locally. Deposit of 25% payable on booking, with remainder payable 8 weeks before arrival We charge a security bond of £200, payable with your final payment, which will be returned within 14 days of your departure provided you leave the place as you found it with no breakages or losses. Reservations at short notice are payable in full when confirmed, along with £200 security bond.